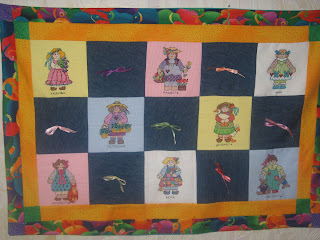 This is quilt for my girls! 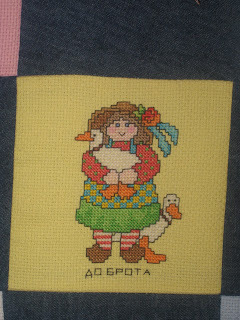 It is from "Cross Country Stitching" magazin. I cross stitch it some months and to finish to Polinas Birthday! I to embroider under each girls good things of character written in a Bible Gal.5:22-23. It is a fruit of Holly Spirit. 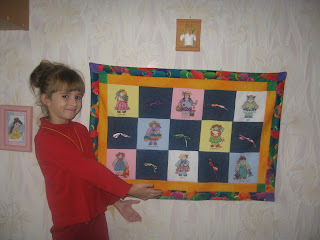 I want, that my daughter could remember it when see this quilt! I also used to do cross stitch in my pastime and you’re stitching is amazing. What a beautiful quilt for a beautiful little girl! What a thoughtful gift that will be a keepsake and blessing! You do such lovely work. Your little ones are beautiful! I love your quilt! How nice to combine cross stitch with quilting. Your daughters will cherish it forever. Wonderful!! And your girls are both beautiful! wow this is beautiful i love it, its so beautiful made and something your daughter will cherish forever. It is so pretty. 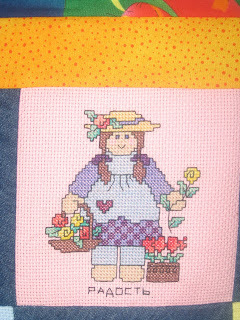 Cross stitch is a hobby I used to do before I got busy with quilting.